Trump has canceled his Neo Nuremberg Rally in Phoenix because it is too hot for Air Force One to land. As temperatures climb in Phoenix, Arizona, more than 40 flights have been cancelled – because it is too hot for the planes to fly. The weather forecast for the US city suggests temperatures could reach 120F (49C) on Tuesday. That is higher than the operating temperature of some planes. 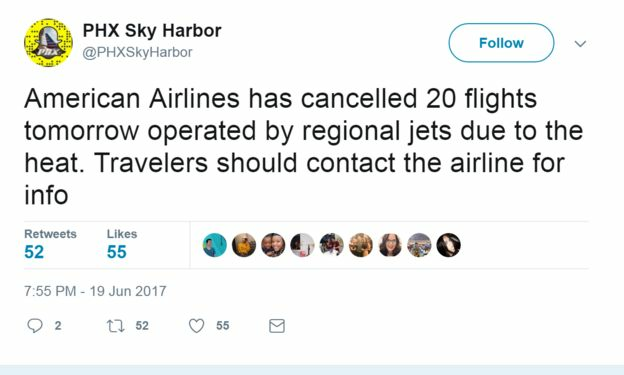 American Airlines announced it was cancelling dozens of flights scheduled to take off from Sky Harbor airport during the hottest part of the day. The local Fox News affiliate in Phoenix said the cancellations mostly affected regional flights on the smaller Bombardier CRJ airliners, which have a maximum operating temperature of about 118F (48C). The all-time record for temperatures in Phoenix is just slightly higher, at 122F, which hit on 26 June 1990. The cancelled flights were scheduled to take off between 15:00 and 18:00 local time. At higher temperatures, air has a lower density – it is thinner. That lower air density reduces how much lift is generated on an aircraft’s wings – a core principle in aeronautics. That, in turn, means the aircraft’s engines need to generate more thrust to get airborne. It’s a well-known problem – a 2016 report from the International Civil Aviation Organization (ICAO) even warned that higher temperatures caused by climate change could “have severe consequences for aircraft take-off performance, where high altitudes or short runways limit the payload or even the fuel-carrying capacity”. Those problems are why many countries in the Middle East, and some high-altitude airports in South America, tend to schedule long flights for the evening or night, when it is cooler. Bigger aircraft like Boeing 747s and Airbus models have a slightly higher operating temperature, and have not been affected by the heat in Phoenix. An American Airlines statement provided to The Arizona Republic newspapersaid those jets should be fine up to 126-127F (53C) – just a little higher than what is expected. Those temperatures, however, are forecast for the aptly named Furnace Creek in Death Valley, in California, with some areas expecting new temperature records on Tuesday. The Death Valley National Parks Service has issued a warning to visitors to avoid hiking after 10am, and to “travel prepared to survive”.